Rotafix Aquachem is a solvent-free coating used a membrane for tanking, waterproofing, gas barrier and as a high-performance floor coating. Rotafix Aquachem is a 2-part liquid epoxy that can be applied as a floor finish. Combining aggregates with the top coat creates a skid resistant surface. Adding flakes to the top coat will give a decorative finish. It has been used extensively in food preparation areas and medical environments as it is easy to clean, resistant to chemical cleaners and resistant to the formation of mould. Rotafix Aquachem can be used as a liquid applied damp proof membrane. The liquid membrane can be applied to prevent moisture ingress both positively and negatively. So if it is applied to the outside of a wall water will not penetrate, equally if is applied internally then moisture penetrating the substrate will equally not penetrate. When used as a damp proof membrane Rotafix recommended that 3 thin coats are applied; this consists of a primer coat and then two top coats. The product performs at its best when applied thinly. 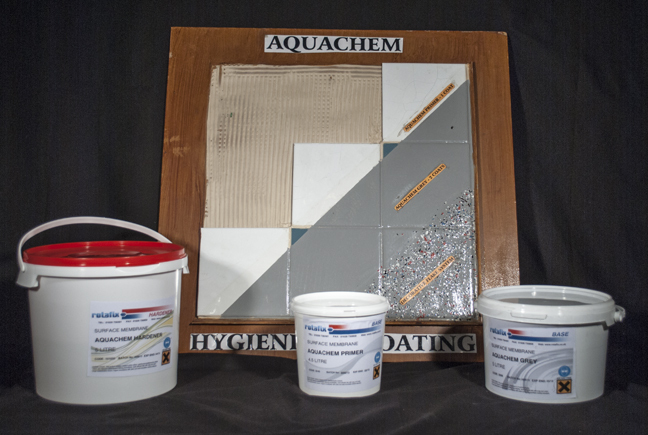 As a damp proof membrane Aquachem will withstand a static head of water to 10m. It has been commonly used on green concrete to reduce the water loss from the concrete during the initial setting of the concrete. This improves the quality and strength of the finish concrete. Rotafix Aquachem damp proof membrane can be used for tanking cellars, water storage tanks and swimming pools. It has been used to line the inside of diesel fuel tanks where condensation is leading to corrosion. 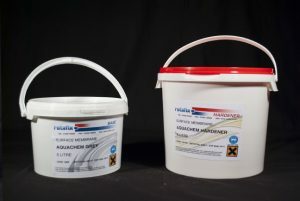 Rotafix Aquachem is safe for marine life and for potable water storage solutions as it is solvent free and water based. 1 litre of Rotafix Aquachem will cover 3-4 sq. m.